It was 90 years ago that Toledo was thrust into the national crime spotlight, thanks to a previously obscure small time crook by the name of Joe Urbaytis. On February 17th, 1921, he and a gang pulled off the largest robbery in Toledo history. 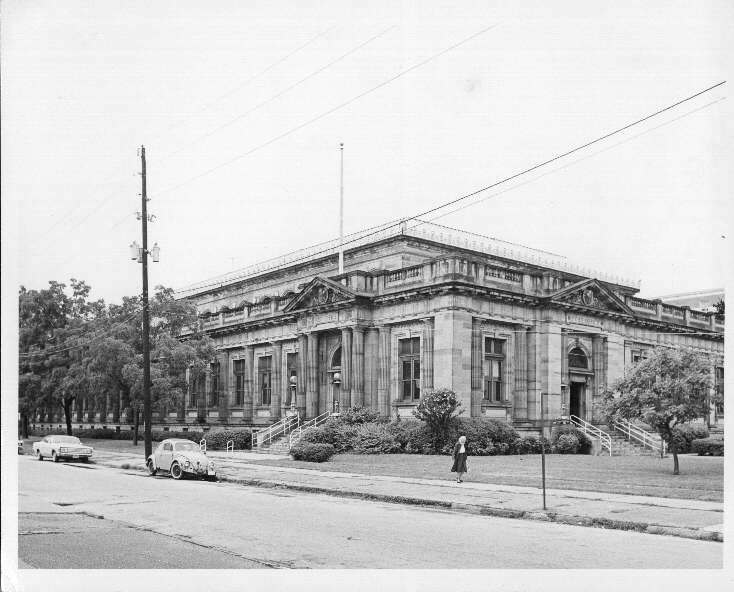 Not a bank or a store, but the main post office building on 13th Street between Madison and Jefferson. Witnesses said they saw a car swerve onto 14th Street at the rear of the post office. The five men inside the car(later found to be stolen) had been tailing a U.S. Postal Service truck which had just loaded up six pouches at Union Station, filled with securities, cash and bank notes. The bandits obviously knew what they were after and when the truck reached the loading dock, the men in the car emerged with guns and began ordering postal workers to the floor. The workers complied and within minutes, the bandits led by Joe Urbaytis were back in the car, and speeding away from downtown. While no one was shot or killed, it was no less dramatic, for this would prove to be far more than a daring but simple robbery. The value of the loot taken in the robbery was estimated to be at least a million dollars. In today’s dollars, according to a CPI inflation guide, that would be worth about 12 million dollars. The biggest heist in Toledo history. Before it was over it would involve more than a dozen suspects, including a local priest, and would also make Joe Ubaytis and members of his gang some of the most wanted criminals in America. The Toledo Police Department, 90 years later, still has the file from that dusty old case. Although yellowed and brittle, the contents fill in the blanks of the investigation that was carried out by Toledo Police and the FBI as they tried to figure out just who had pulled off this stunning caper. The case was a high priority and the intense pressure eventually lead to the arrests of 18 people, including the “mastermind” of the operation, Joe Urbaytis. He had been a small time criminal with a lengthy rap sheet, born and raised in the Polish neighborhoods of Lagrange Street. The file tells a riveting story of how TPD officers worked for days to find Urbaytis, whom they had suspected from the early start of the case. They had also suspected he might flee to Chicago along with his other familiar compatriots, George Rogers and Charles “Split Lip” Shultz. On the evening of February 22nd, 1921, police and railway detectives found Urbaytis and some of those gang members on board the Toledo to Chicago train near Elkhart, Indiana. 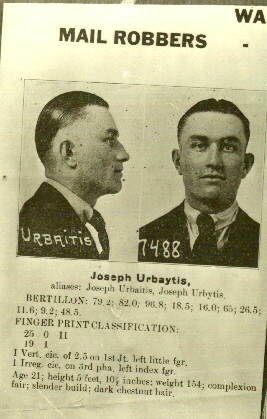 Urbaytis might have been in custody, but he proved to be very uncooperative and did not give up information easily. After he and about a dozen others were convicted in federal court that summer of 1921 of conspiracy in the case, they were still awaiting trial for the robbery itself. But Urbaytis, Rogers and Shultz had other plans and managed to overpower the turnkey at the Lucas County Jail and escaped. They remained at large for years and It wasn’t until 1924, that Urbaytis turned up again. This time in Columbus, Ohio, where he was involved in a dramatic gun battle with police, and was shot. Seriously wounded, he lay in a Columbus hospital and allowed reporters in for bedside interviews and photos. He reveled in his notoriety as a popular public enemy. Eventually he recovered and was sent back to Toledo where he and the others faced the legal system and were eventually convicted of the robbery and the additional escape charges. Facing a 60 year sentence, he was shipped off to federal prison. But the Toledo native, was not to be confined for long, and in 1928, he slipped his bonds again, escaping from federal prison in Atlanta. But this time when he was recaptured, in 1934, federal prison officials sent Urbaytis to the “Rock”, the Alcatraz, federal prison on a remote island in Oakland Bay California where escape was improbable. The story could have ended there and Urbaytis might have died in prison and obscurity, but once again he escaped. This time, however, by virtue of a shortened sentence and a second chance at freedom. In 1943, Urbaytis was released and came home to Toledo, but instead of takinga low profile after his new found freedom, the ex-con and notorious crime figure almost flaunted his freedom by opening an unlicensed night club on Woodville Road, near the railroad overpass. But in 1946, Joe’s streak of luck ran out. He was gunned down inside of his Bon-Aire Supper Club on Woodville Road. He did not esacpe death. His life of crime was over. Toledo Police Chief Ray Allen even wrote a letter to FBI Chief J. Edgar Hoover letting him know that Urbaytis had been shot and killed and the FBI could close the books on him for good. Ninety years later, all that’s left is a thick and brittle file in the Safety Building, crammed with photos, mug shots, fingerprint cards, police reports and newspaper articles telling the 25 year tale of the robbery and the “brains” behind it and his violent demise. There are still, however a few more loose ends that this author and others are trying to resolve. It seems that one of the gunmen in the 1921 heist was known as “James Colson”. His real name was Nathan Otterbeck and he was not arrested until 1923. A newspaper article I found from that era, says he was arrested on a train in Davenport, Iowa. Family members continue to search records to find more information about him and his background. We do know he died under another name in Idaho. If you have more information about Colson or Otterbeck, let us know.